Should I use a new domain for my membership site? One of the first and most basic things you need to consider when building your membership site is where it’s going to live. Will you be adding it to your current website? Setting up a new website? What about a sub domain? It can be confusing to know which is best, so today I’m going to take a little look at the options. If you add your membership to your current website your design and layout will typically be dictated by the theme already being used. So, scope for completely new branding and custom styles for your membership is minimal. Your membership is essentially just another part of your website, not a separate entity. You could of course use the OptimizePress plugin or similar to allow you more creative freedom than your current theme allows. But remember that you also want a sense of cohesion between your website and your membership – if members go to your main website to login you don’t want them to feel confused if they remain on the same site but your membership looks completely different. 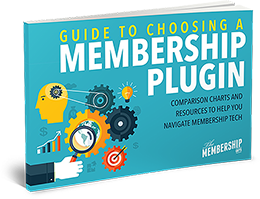 Another consideration with using your current website is the other plugins that you have installed and whether or not these will cause any issues with your chosen membership plugin. If you’ve only got a couple of basic plugins installed you’ll most likely be fine, but the more plugins you have, especially if you’ve got ecommerce plugins or page builder plugins, the more likely you are to run into issues. For these reasons, adding a membership site to your existing website typically works best for smaller memberships, like an individual course, than for sites that are going to have a lot of different functionality involved. This is where you essentially use the same domain but create a separate subsection that houses its own WordPress installation – something like members.yourwebsite.com. This gives you the freedom to install a completely new theme and set your membership site up completely separately from your main website, however you’re still using your current hosting which saves some money – but the down side to this is that you’re sharing your hosting resources with your main website too. Subdomains can work well when your membership is the main product of your website but you want to keep the style and functionality separate – for example the femaleentrepreneurassociation.com uses the subdomain mc.femaleentrepreneurassociation.com for its actual membership. It keeps the two elements connected but removes the main cons of using the same website. It’s worth bearing in mind that some membership plugins – like Zippy Courses – specify that they should be used on either a separate domain or a sub-domain, so this may make your decision for you when it comes to choosing between your current site or subdomain. The last option is to use a domain just for your membership site. This is great for creating a complete brand around your membership and giving you complete freedom in terms of style, layout and functionality. Having a url custom for your product is also useful if you want to be able to introduce it as a standalone product and focus your marketing explicitly on your membership. You essentially have a blank canvas to work with when creating a new site for your membership, meaning that you’re not having to worry about clashes with existing plugins, keeping existing colours and layouts or sharing your hosting resources. Yes, it’s more work to set up, but it’s usually worth it. You can still have a front facing website as well with this option – you could have a blog on the site for example to drive traffic – or you can simply have a sales page as your front facing element of the site. If your membership site is going to be a major feature of your business, will have different branding, a large number of members, or a lot of functionality involved, then a separate site is the best option both for future growth and for targeted marketing. Which option is best for you will depend on a number of factors, including cost, the type of membership you’re creating, its place in your business, and the functionality you require. It is quite difficult to move a membership site once it’s created though so don’t just think about what is best for now, think about your future plans for the site too – whilst adding your membership site to your existing website might seem like a time and cost saving solution at the moment, if you want it to become an all singing all dancing membership site with thousands of members in the future, is that still going to be the right call?